Tuesday greetings to you from Rhonda! Today I am showing you an easy technique to create some texture for most any project. 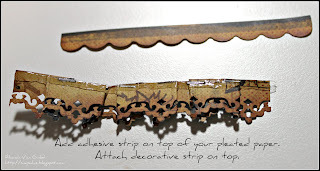 It creates a look of ribbon using your paper scraps. For my project today, I used our latest line “Copper Kettle” from the November Club Q Kit! The line is so very timeless and elegant. 1. To begin, I used a scrap of my paper approximately 10” x 1.25”. 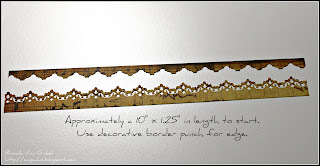 Punch a decorative edge using one of your favorite border punches. I used Apron Lace by Fiskars here. 2. Fold the strip as shown. 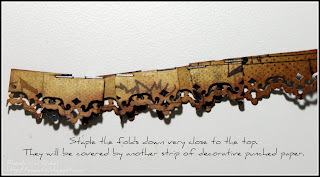 I fold under about ¼” and leave the length approximately ¾ for each pleat. Note: I am creating this for a card and I did not need a lengthy strip of pleated paper, but if you do, just tuck in the paper under the fold and you will have a nice length for whatever your project needs. 3. I inked the edges of my intricate punch and then using my stapler, tacked down the pleats so they will lay flat. This will allow me to add a transitional border to finish up the top. 4. I used a simple scallop border punch for the top transitional piece. Add adhesive (I used zip strip.) to the top of your stapled border edge of your paper ribbon. Adhere the scallop border on top of your pleated paper. 5. Here is how I’ve used the paper ribbon on my project. I love how it’s a subtle look, but adds texture and interest. The best part is that your paper can always match your project well! - Altered my flowers leaves with a Copic marker in Moss to better blend with the color scheme. - Tore my leftover scraps from other projects for this card. I also tore my vellum quote. One more interesting thing I noticed is that although the papers I used are musical notes and stripes, it almost takes on an animal print feel. Interesting isn’t it?!!! I hope you enjoyed my little technique tutorial today! I had a blast creating this fun card!!! Thank you and have a super creative day! What a great & simple way to add dimension to any project! :) Thanks for sharing! This is wonderful I love the colors this is a very lovely card..Thanks for sharing I learned something new. I have done this on a layout, but not on a card! Thanks, Rhonda! gorgeous card Rhonda! i love that technique!